Many of us know that four presidents have been assassinated (Abraham Lincoln, James Garfield, William McKinley, John F. Kennedy). But what is less known is there have been numerous attempted assassinations and threats against not just presidents, but presidential candidates. The definitive book: Dr. Ronald L. Feinman has written the definitive book on the subject, entitled Assassinations, Threats, and the American Presidency (Rowman & Littlefield, 2015, 254 pages). This factually accurate book is packed with engaging historical perspective and trivia. Dr. Feinman’s writing style is clear, logical, objective, comprehensive, and brings order to the chaos surrounding some of the assassinations and threats. It is very readable and captures the attention of the reader. 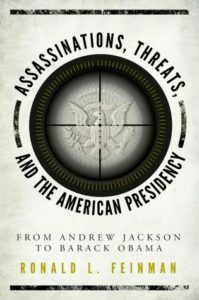 The book sets the assassinations and threats in historical context, and includes information about each target of an assassination or attempt and compactly summarizes their life and administration or candidacy. He also unpacks the life of the assassin, and probes the various conspiracy theories surrounding many of the events. Andrew Jackson: Shortly after the attempted assassination of Andrew Jackson by Richard Lawrence, in which two guns both misfired at close range, Jackson was the subject of an apparent death threat in a letter written by Junius Brutus Booth, the father of John Wilkes Booth, who eventually assassinated Lincoln. Harry S Truman: In 1947, President Harry S Truman was the target of an assassination attempt with a letter bomb that was defused by the Secret Service. This was before two Puerto Rican nationals attempted to storm the Blair House where the Trumans were staying while the White House across the street was getting an extreme makeover. John F. Kennedy: When John F. Kennedy was still president-elect, there was a plot to crash a dynamite laden car into Kennedy’s car. And in early November 1963, there was a plot to assassinate JFK in Chicago by shooting at his motorcade. Richard M. Nixon: A would-be assassin stole a helicopter with plans to crash into the White House and kill President Richard M. Nixon. 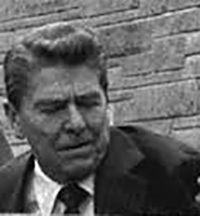 He buzzed the White House in the middle of the night (when the Nixons were away), landed on the lawn, and was captured and wounded by gunfire by security personnel. About the author: Dr. Feinman has been a Professor of American History, Government and Politics for more than 40 years, including 22 years as Senior Professor at Broward College, and an Adjunct Professor of History and Political Science at Florida Atlantic University (FAU). He also blogs at The Progressive Professor. Dr. Feinman is extremely knowledgeable and a great writer. I highly recommend this book!